Beauty Style Growth: Got Wrinkles and Smile Lines? Got Wrinkles and Smile Lines? Clinical Pro Line Eraser is formulated with the anti-aging molecule A-F33-an exclusive technology that's not even available in a dermatologist's office yet! Inspired by years of research, Clinical Pro Line Eraser was developed by the same leaders in topical anti-aging treatments that created AHA's created 20 years ago. The patented A-F33 works-unlike some other leading anti-aging ingredients-to deactivate collagen blocking and help effectively spark collagen production in just 72 hours. * Deep wrinkles begin to fade in just 1 week and 100% of women showed improvement in fine wrinkles! 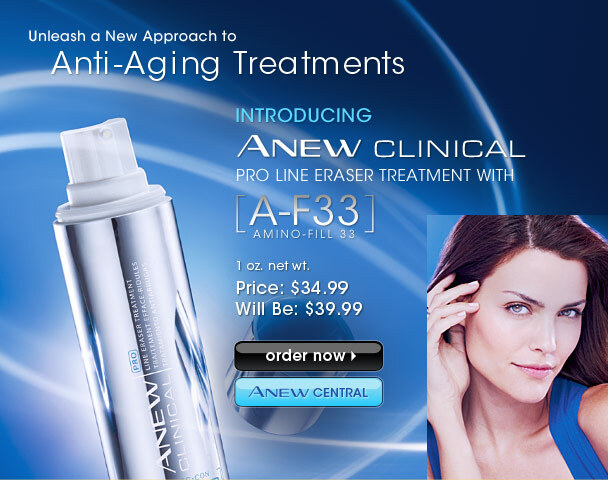 Offered exclusively through Avon, Clinical Pro Line Eraser offers a new approach to anti-aging, and has the potential to be the crown jewel of our ANEW line of products. 4. Apply your Day moisturizer (for Morning) or Night Moisturizer.